Discussion in 'Mac Basics and Help' started by tschmed, Jun 29, 2013. Hello. My 1st post and I'm far from a geek so talk to me like I'm an idiot. FYI, I have an older MacBOOK Pro 17 with 10.6.8 installed. When using Safari or Firefox, how do I open a new window and keep an existing window in the dock? It's very annoying to have a page sitting down in the dock, and want to open a new page and always have the 1st page automatically come back up when the browser icon is clicked upon. I remember an older software version that allowed the page to stay in the dock and I'd have to actually click on it in order to bring the page back up. This newer software version automatically brings it back up when the browser icon is clicked upon. I'm not sure how else to phrase the question, but I will try if needed. EDIT: I see what you're saying now. Right click the icon -> new window. Or command+tab and select Safari. Then command+n to open a new window. 1. Activate Safari with cmd-tab. 2. Observe the minimized window from Dock expands. 3. Press cmd-M (Minimize from Window menu). 4. Observe the front window returns to Dock. 5. Press cmd-N (New Window from File menu). 6. Observe a new window appears. It takes much longer to read than to perform. Also, see cmd-option-M to Minimize All. 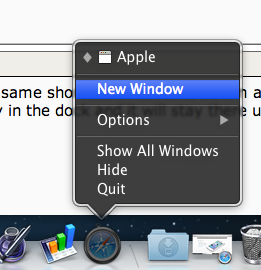 To see the different menu options, drop down a menu, such as Window, then press the option/alt key. The menu item titles will change.